The mind-blowing debut of "Legion" demands further discussion. Here's what you may have missed on first viewing, and why it deserves a second look (at least). In terms of plot, the “Legion” premiere isn’t hard to summarize. David Haller (Dan Stevens) is committed to a mental institution after trying to kill himself. There, he falls in love with Syd Barrett (Rachel Keller), a woman who believes David’s “sickness” is what makes him special. But David might not actually be sick. He may have telekinetic and telepathic powers, and when Syd is allowed to leave and he isn’t, David uses those powers to get back to her. Of course, the presentation of the plot — the story driving “Legion” — is much more complex. David is a damaged, untrusting young man seeking a connection to reality that his mind refuses to provide. Syd represents that connection and may be looking for a forbidden connection herself. The couple, joined by a group of similarly alienated individuals, rebel against their oppressors to find happiness within and among themselves…via mutant superpowers. But what’s truly marvelous about this Marvel adaptation is how creator, director, and writer Noah Hawley (“Fargo”) corrals all of the above into a thrilling, gorgeous, and all-around remarkable 67 minutes of television. There’s a lot to be admired from a lot of levels, so we thought we’d break down nine telling moments in order to better appreciate their creators’ artistic efforts as well as what they might mean for the future of “Legion.” Take a look below, and be sure to tell us your favorite parts of the episode in the comments section. Let’s start from the beginning: Noah Hawley’s introduction of David Haller was told in a dialogue-free, decade-spanning montage all set to the beat of The Who’s “Happy Jack.” We watched as a cute little baby morphed into a happy young soccer player and scientist, who then slowly let the voices in his head turn him to trouble. Happy David wasn’t so happy anymore, and drinking led to an arrest which led to medication, depression, and an attempt at suicide. Fun fact: The costume department went above and beyond the call of duty in “Legion.” For a superhero show firmly grounded in reality, subtle alterations to classic looks provide an anomalous vibe without feeling cartoonish. David’s white button-down worn while under interrogation lacks a collar. Lenny’s headphones are big, bulky, and a bit out of date. But the orange uniforms patients sported in the mental hospital actually contained a secret code for the staff to distinguish which inmates were the most dangerous. But the scene we’re referring to is David and Syd’s romance. Their meet-cute sets up a courtship similar to the opening scene in that it plays out via a montage set to music. This time, after David quickly asks Syd to be his girlfriend in an adolescently sweet (a.k.a. blunt) fashion, the Rolling Stones’ “She’s a Rainbow” kicks in as we watch the two joke about cherry pie and hold a piece of clothing to mime holding hands. The overall production design of “Legion” deserves an article unto itself (hint: that’s on the way), so it’s worth noting when Hawley first fully utilized his detailed and expansive surroundings. After David tries to help Syd imagine being outside the mental hospital, we cut to an interrogation room where David is sitting across from Hamish Linklater’s government official. The interrogator is asking about “the girl who disappeared,” which we (correctly) assume is Syd, even though David didn’t really have anything to do with her escape. No matter. When David needs a break from discussing his missing girlfriend, the interrogator gets up and walks out of the kookily intimidating room, unveiling a far more frightening operation outside. The camera tracks him walking quickly through the floor of an empty pool being guarded by men wearing black masks and carrying machine guns. One of them opens a door for the interrogator, who heads down a short hallway and takes the stairs up to a command center constructed a good 15 feet off the ground, overlooking what appears to be a high school stage. There, the armed guards are on break, watching TV, but the camera soon swings back to the interrogator who’s checking in with his boss, an older man watching David from a TV in the operation center. It’s not a particularly long or overly ambitious one-take, but it conveys a lot of important exposition — David’s value, the scope of the situation, what’s going on outside the room — all while establishing pertinent geography for later scenes. That pool soon comes into play, and we needed to understand where it would come from in order to believe we’re in a real place. Visually conveying that we’re in a school makes absorbing that information interesting and saves time in the long run. Plus, long takes are fun. And “Legion” is fun. So there. Hinted at in previews and earlier in the episode, our first look at the full scene comes when David is taking a break and — after looking at a small statue of a dog — remembers a major telekinetic breakthrough. Angry at an old girlfriend, he walks into the kitchen screaming, “I don’t want to talk about it” and gripping the sink with both hands. Then he hears a rattling: It’s a bin of bagels shaking on the counter. Suddenly the door pops open. David lets in a small gasp. He looks around the room and we shift into slow motion: the cabinets, drawers, refrigerator, and anything that can open does, forcefully expelling its contents into a tornado of junk swirling around our anguished hero. It’s important to note that momentarily, he marvels at what he’s done. He seems calm or at least accepting of the chaotic situation. But then a knife flies by his face and cuts him, right before he glances down to see “the devil with the yellow eyes” sitting in the corner. He first used the descriptor for the fat, bald, terrifying being in therapy earlier in the episode, and this glimpse at him during a peak moment of David’s power is telling. Why is the devil there? Where did he come from? And what is he trying to do to David? We’ll come back to that in future episodes — as well as this visually astounding kitchen scene. David just couldn’t let Syd leave without sharing their first kiss, and there hasn’t been a more catastrophic smooch since King Edward VIII and Wallis Simpson. Though the aftermath requires a lot of piecing together, it’s important to note we could hear Syd telling David to stop without actually hearing her speak. They appeared to be communicating telepathically, but even such a direct connection couldn’t stop David from planting a parting peck. At this moment, most audience members don’t know what’s happened yet. And the next thing we know, “David” is staring at the yellow-eyed devil again in a room bathed with red light. “Syd” hears an explosion from the nursing office, and she looks at herself in the mirror, trying to take in the change. Only when she starts to touch her face, neck, and…other things does Hamish Linklater’s government interrogator stop the story to make David tell us what happened: They switched bodies, meaning it was Syd using David’s powers that turned the hospital upside down. What started the entire sequence was Syd waiting in her room to say goodbye to David, and the sound of two other patients playing ping pong outside. When David is asked to talk about “the incident,” the first shot of his recollection is of the table from above, and we hear the back-and-forth sound of “ping” and “pong” as a ball bounces between players. It sets a rhythm for the scene, as Syd sits on her bed waiting and well-timed cuts show the players battling. That’s when the switch happens, but the ball doesn’t complete its journey until Syd and David’s doctor returns to the common room — now empty and filled with red light — and the ball bounces directly to their feet. Something’s coming. A new scene is born. David and Syd’s journey isn’t a game anymore. Aubrey Plaza isn’t an actress you can introduce at the beginning of an episode and kill off by the end. We, as a people, simply cannot stand for such things. Plaza is too fascinating an actress — and too perfect for this world, in particular — to only serve as a surprising death or emotional baggage for the main character. Moreover, Lenny served as a wild burst of energy, filling her scenes with enough added personality that you wouldn’t be blamed for watching her instead of David. So when we were told she died — implanted in a wall after David and Syd switched bodies and Syd freaked out — we were heartbroken….until she came back. An imaginary friend may be out of place in other shows, but David’s many perceived versions of reality allow for such a character to exist in “Legion.” We’ll see more of Lenny in flashbacks, too, but having her pop up and talk to David in the present is a treat we’re glad not to be denied. Though the joyous, choreographed dance number only took place in David’s mind, that did little to lessen our love for it. Syd led the rest of the patients in a smiling, exuberant sequence set to the tune of Serge Gainsbourg’s “Pauvre Lola” but also to Syd repeating David’s name over and over again. Finally, he wakes up; submerged in a pool meant to entrap him while the government mines him for more answers (and data). It’s very much the opposite vibe of his mental happy place, and I doubt any audience members would’ve minded spending a few more minutes asleep so David could hold onto those good vibes. Like so many classic escape plans, it all started with planting a girl inside a memory. When asked where Syd was, David remembered being outside the mental hospital, looking for her. From there, people started following him until suddenly Syd appeared… in the back of a person’s head. Then the rest of her showed up, and she explained that she wasn’t really there. She was inserted into his memory to explain how he was supposed to escape. Such a confounding idea demanded she convey the information as bluntly as possible (she even explained it twice), and then… boom. David slid out of his chair just before the pool room exploded above him, frying the guards and allowing Syd, Ptonomy (Jeremie Harris) and Kerry (Amber Midthunder) to get in and get him out. And from the second they walk out, it feels as though we’ve stepped out of a television drama and into a big budget Marvel movie. With guns firing and bad guys being tossed around without a hand touching them, David & Co. make their way down the side of the mountain in an ambitious, breathtaking long take. There might have been one masked cut right before an enemy grabbed David by the throat, but otherwise it’s a single shot all the way down. The lack of cuts wasn’t just for show. It helped “Legion” stay grounded in reality, right when it could’ve drifted into into superhero heights. At the bottom of the mountain (after the one take ends), David demands to know if what he’s going through is real or imagined. After an hour-plus with “Legion,” we were wondering the same thing, and Hawley’s stylistic choice helps us believe just as Syd helps David. It’s a crowning moment of an episode filled with them. We can’t wait to see what comes next. 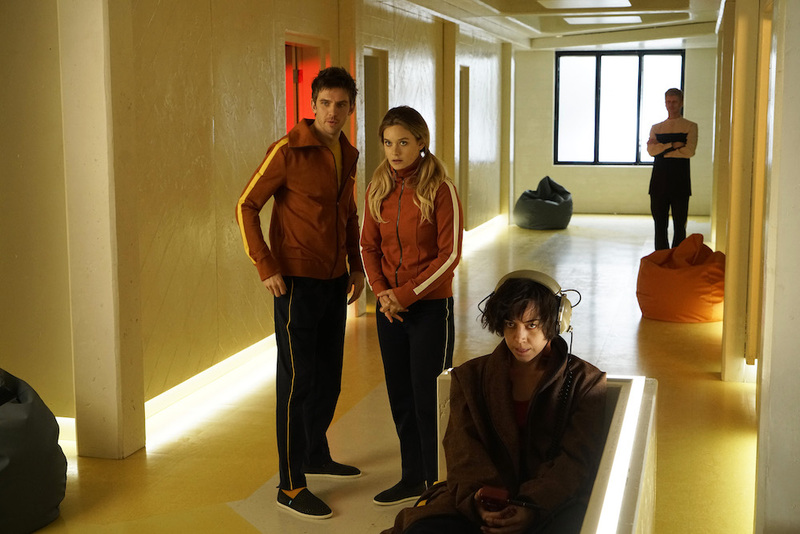 “Legion” airs new episodes every Wednesday at 10 p.m. ET on FX.